In my opinion, the way to anyone's heart is through a well-balanced cocktail. I'm sharing two of my favorite Valentine's cocktails. Both are very different, but easy to make...you'll thank me later! This is the cocktail for the people who absolutely must drink something pink on Valentine's. Cupid's Arrow is slightly sweet and topped with sparkling Rosé, it'll definitely hit the spot. Shake, strain and top with sparkling Rosé. Coffee: The scent was found to be a major turn on for women. Coffee's hefty dose of caffeine boosts heart rate and increases blood flow, while its alkaloids can help to maintain sexual performance while also increasing stamina. Cardamom: Certain cultures deem it a powerful aphrodisiac and also claim it is beneficial in treating impotence. It is high in cineole, which can increase blood flow in areas where it is applied. Shake vigorously, strain into a chilled coupe glass, garnish with 3 espresso beans. White Cashmere cocktail - it's more than you think! Do you remember any of the resolutions that you made for 2014? Yeah, I hadn’t remembered any of mine either… except for one. Last year, I made a resolution to find a place of my own where I could work on cocktail development and hold my events. It all began when my friend, Dana Chen, and I began to notice a need for space in many different capacities. Between the two of us, we knew dozens of freelance professionals and small business owners who regularly worked from home or at a local coffee shop. Many of them were looking for another work space option. I totally understood their need because I myself had started to outgrow my apartment with all of my libationist ingredients and equipment. It was a lightbulb moment for us and toward the end of last year, we found the perfect spot. Table of Typewriters is a multi-purpose space: co-working office by day and event space by night. Co-working spaces fill the need for start-ups and small businesses who are looking for an affordable office; and we’re excited to support our peers in the small business community. Event space is another big need. People always ask me for venue recommendations. With Table of Typewriters, not only are we opening our space up to the public for event rentals, but we also plan to host a variety of events beginning with our Valentine’s Day event. Dana and I couldn’t think of a better way to start the new year than with an open house welcoming our friends and family to our new space. 2014 was an amazing year on so many levels. Reconnecting with old friends and making new ones. Embracing new opportunities and taking on new adventures. You may be wondering — what’s my resolution for 2015? Simply put, my resolution is to keep evolving. I’m grateful to be one of the fortunate people who gets to do what they love for a living. And I want to keep growing in my craft. I’m working on a few exciting projects right now and I look forward to sharing them with you very soon! If you’re ever in the Edgewater neighborhood, we invite you to stop by Table of Typewriters and say hello! Cheers to your resolutions and happy New Year! Lauren and Steve Harvey enjoying eggnog cocktails from sweet to savory! As Shown on the Steve Harvey Show: Holiday Eggnog! As seen on the Steve Harvey Show - holiday eggnog recipes for you to try at home! Being the libationist that I am, the part of Thanksgiving that excites me the most is the cocktail hour. And while wine and beer are good to have on hand, I love to greet my guests with an herbal cocktail. Herbal cocktails are completely on trend these days and Thanksgiving is the prime time to transfer those traditional herbal flavors from food to drink. Trust me, whipping up a cocktail is easier than you think and best of all, if you burn the turkey, no one will notice! I have an easy herbal syrup recipe that won’t require you to take yet another trip to the market. Just by using a few of the ingredients that you’ve already lined up for your Thanksgiving dinner, you can create an herbal infused syrup for your very own signature cocktail. Herbs can be used in several ways including infused in syrups, bitters and liquors; they can be muddled in cocktails; and herbs are great as a garnish. The important thing to remember about making syrup is that herbs should steep in your simple syrup mixture (just equal parts sugar and water) until you reach your desired flavor - this will take up to 30 minutes. You can use the syrup with anything from cocktails to nonalcoholic drinks (think sparkling water!) and even desserts. 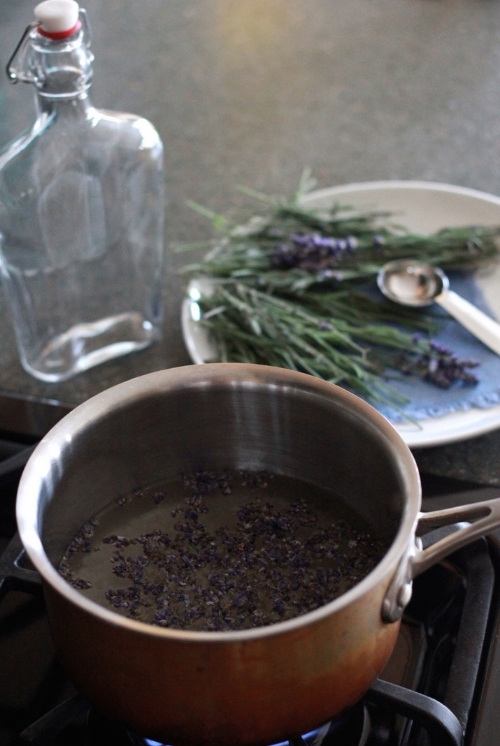 As a time saver, make your herbal syrup in advance. Syrups will last for about 1-2 weeks in the refrigerator. Puree cranberries and 1/2 cup sugar (or to desired sweetness). Add cranberry puree, sage, remaining 1 cup sugar and water to a small saucepan over high heat and bring to a boil. Turn to low and let simmer for 10-15 minutes. Once the liquid has cooled, strain. Add desired amount of syrup to bourbon, rye or gin, add ice, shake, pour and garnish with a sage leaf. Voila! Another great seasonal cocktail is my falljito. Yup, it’s just like a mojito, but with the flavors of fall front and center. In my video, I walk you through the steps to create this cocktail on your own. Give it a try and let me know what you think! Give my falljito cocktail a try! No matter which cocktail you decide to serve this Thanksgiving, have fun with it! Don’t forget to tag me in your Thanksgiving cocktail photos on Instagram, Facebook and Twitter @LPLibations! In my last blog post I promised a full recap of my summer camp experience at Bourbon Camp. Yes! Bourbon Camp is a real thing - located at Kentucky’s Camp Runamok in the heart of the bourbon capital of the world, miles and miles away from the Windy City. Now, if you went to summer camp as a kid, you’ll remember that all things began with an ice breaker. Well, at Bourbon Camp, the adult version of that took shape in the form of a warm greeting and a nice cup of Angels Envy to start the morning. That really set the tone for the week ahead!